Emperor Montezuma, who lived between years of 1466 and 1520, has been recorded in history with varied different spellings such as Motecuhzoma, Moteuczoma, Moctezuma and Motecuhzoma Xocoyotzin by ancient Nahuatl texts. He was the ninth ruler of Tenochtitlan and he reigned as Emperor of the Aztec Empire from 1502 to 1520. The Spanish conquest of the Aztec Empire occurred during Emperor Montezuma's reign. Emperor Montezuma last words are very important to the Spaniard who was in his city preparing to conquer. His last words described the emperor, who he was and how important his people were to him. They are a part of history and give people some insight into the who he was, why he was important. "I confide to your care my beloved children, the most precious jewels I can leave you. The great monarch beyond the ocean will interest himself to see that they come into their inheritance, if you present before him their just claims. I know your master will do this, if for no other reason, then for kindness I have shown the Spaniards though it has occasioned my ruin. For all my misfortunes, Maliche, (said to be what Montezuma referred to Cortes as) I bear you ill will." Through history, however, some say his last words were this, "And do you think I, then, am taking pleasure in my bath?" Montezuma was a very clean man, bathing daily in the afternoons. It has been said that once he wore a set of clothes, he wouldn't wear that outfit again for several days. Throughout history, the portrayal of Montezuma has been of a man who ruled over a fallen nation. Historians have suggested that he was very indecisive and even weak-willed. When the Spanish invasion happened, it was Montezuma's weak will that left him with a fallen nation. The depiction of what Montezuma looked like comes from a portrait called True History of the Conquest of New Spain painted by Bernal Diaz del Castillo. Montezuma was estimated to be forty at the time of the conquests and was said to be of "good height", to be "well proportioned", to be "spare and light" and "not very dark, though of the usual Indian Complexion." He had short hair, a short black beard, his face was long, cheerful and his eyes were fine and detailed. Throughout Montezuma's life, he has been reported to have kept many women as mistresses; most of them were the daughters of the chieftains. However, he did have two legitimate wives. Montezuma had eight daughters, which included Tecuichpo and eleven sons, which included Chimalpopoca and Tlaltecatzin. His name is defined as "he who is angry in a noble manner" or "he is one who frowns like a lord." In 1517, Montezuma was notified that Europeans has landed on the east coast of his empire. Montezuma posted more guards and told them that he wanted to be notified of any further sightings of foreigners. In 1519, Montezuma allowed the man into his city that ultimately caused him his demise: Cortes. At first they played nice, buying and exchanging gifts such as the an Aztec Calendar made of gold and one of silver that Montezuma gave to Cortes. Cortes later melted them down for their material value. Things ended for Montezuma, however, after Cortes was invited back to his Tenochtitlan as a guest. 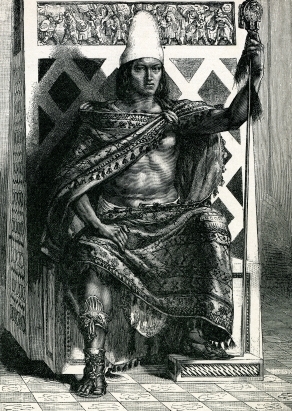 Although Montezuma had kept reign over his people, he soon became a prisoner in his own house. Montezuma told Cortes to leave and so he did. Lines between the Spaniards and the Aztecs became hostile and soon Montezuma became a hostage to sustain the Spaniards security. The truth of how Montezuma died is still unknown today, although it was after Cortes returned that he was killed. There are different beliefs as to why he was killed, some believe that he was no longer able to pacify the Aztecs and because of that, he was no longer needed. Soon after, the Spaniards conquered Tenochtitlan. The Aztecs killed Montezuma's sons. His daughter, Techichpotzin, was given the name Isabel and was married off to different conquistadors who laid claim to the heritage of the Aztec empire. "Emperor Montezuma\'s Last Words." YourDictionary, n.d. Web. 20 April 2019. <https://quotes.yourdictionary.com/articles/emperor-montezuma-last-words.html>. Emperor Montezuma, who lived between years of 1466 and 1520, has been recorded in history with varied different spellings such as Motecuhzoma, Moteuczoma, Moctezuma and Motecuhzoma Xocoyotzin by ancient Nahuatl texts. He was the ninth ruler of Tenochtitlan and he reigned as Emperor of the Aztec Empire from 1502 to 1520. The Spanish conquest of the Aztec Empire occurred during Emperor Montezuma’s reign.